Posterior vitreous detachment, or PVD, is a common cause of floaters. 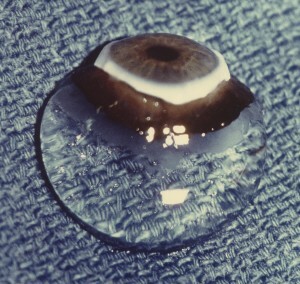 Posterior vitreous detachment is separation of the back surface of the vitreous body–the gel that fills the center of the eye (see image)- from the inner surface of the inside of the back of the eye, the retina. Posterior vitreous detachment is the most common cause of floaters. A PVD, or posterior vitreous detachment, will occur in everyone, as we get older. The most common symptoms of a posterior vitreous detachment are floaters. New floaters should always be examined by your vitreo-retinal specialist, or your eye doctor, especially if associated with flashing lights, since that can be associated with a retinal tear. Retinal tears can cause retinal detachments, which are potentially blinding. What Are Posterior Vitreous Detachment Symptoms? The most common symptoms of a posterior vitreous detachment are floaters, or hazy vision described as looking through a “cobweb.” Floaters are hair-like, fly-like, grey linear structures that sometimes look like seeing through gauze. Flashes are caused by changes inside the eye related to the vitreous gently tugging on the retina. The floaters and “cobweb” should move to and fro with eye movement, as these opacities are actually located in the vitreous gel. Flashing lights arise from the retina, which may be damaged during PVD. As this gel moves with eye movement, so do the floaters. How Does Posterior Vitreous Detachment Occur? When the vitreous body gel becomes so liquefied, it collapses and the back surface moves forward away from the retina. This casts shadows upon the retina, which lines the inside of the back of the eye and acts like a film in a camera. PVD typically happens in the 50s & 60s of life, 10 – 15 years earlier in near-sighted people. On occasion trauma may cause a PVD, but most of the time a posterior vitreous detachment simply occurs by itself. Remember it is a natural event and therefore is related to the aging process. Who Is More Susceptible to Vitreous Detachment? Vitreous detachment is actually very common, occurring in two out of three people over the age of 65. Nearsighted people are more susceptible, with PVD occurring in early middle-age. PVD can happen to anyone in late middle-age. Patients who have had recent cataract surgery are at slightly higher risk for developing a PVD, as well as those who suffer a physical eye trauma. Again, all new flashes and floaters should be examined by a retina specialist, or your eye doctor. Floaters caused by PVD can be removed when the floaters cause decreased vision and/or decreased contrast sensitivity (the ability to distinguish 50 shades of grey). When the floaters are very bothersome and reduce contrast sensitivity , the offending structures are excised with a five to ten minute microsurgery. This microsurgery is called vitrectomy. A vitrectomy is the core operation performed by retina specialists. Are There Any Risks with Treatment? The risks with vitrectomy for floaters is very minimal: There can be infection, bleeding, retinal detachment, elevated pressure, and cataract. We have never had a case of infection or retinal detachment. In an extremely rare case bleeding occurred, which cleared on its own after two weeks and without intervention. By two years after vitrectomy surgery to remove floaters, our patients have only had to undergo cataract surgery 40% of the time, which is far less than others who report an incidence of 87%. None of our patients under the age of 53 have required cataract surgery, followed now for almost three years since surgery to remove floaters. This is because we have designed a special method to do this surgery specifically for eye floaters. While vitrectomy is a very common procedure performed by most retina specialists, we have redesigned it in order to successfully cure eye floaters.